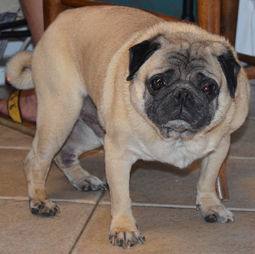 RIP Sweet Otis- We are heartbroken that this precious boy crossed over to the Rainbow Bridge. He had been at the vet to determine why he loses his balance. Dr’s thought it could have been a brain tumor and he appears to have had a stroke. No matter how many pugs and others we rescue come into our lives, each and every one of them stay within our hearts forever.